With the exponential growth of technology, the access, capabilities and opportunities are changing. This makes it interesting to reflect on past endeavours and translate them to the current realm. It is this challenge, that V2_ and In4Art have taken as a starting point for their first collaborative Re-enactment project. A project in which an artwork from the V2_ archive will be re-enacted to guide curiosity. Dutch artist Dani Ploeger proposed to re-enact the work Amplified Body by Stelarc from 1994 . A work that deals with the relationship between humans, machines and the environment and ultimately the role and functioning of the body. Stelarc once remarked: “We have to design bodies to match our machines.” Now, 25 years later, Dani Ploeger will re-enact the work with Appendix Machina, where he will replace the specialist devices used in the original work by their contemporary consumer technology-equivalents to create biofeedback extensions. Advanced digital technologies are increasingly taken-for-granted, much like mundane items, rather than the mystical harbingers of a sci-fi future as how they were still often perceived in the last decades of the 20th century . Additionally, Stelarc claimed ‘the body is obsolete’ while in current society we much more encounter the foregrounding bodily fragility and the embeddedness of bodies in culture . The re-enactment will question if and how the human body transforms through technology? And ultimately, will the body become obsolete? With the urge to monitor, quantify and predict, (bio)technology is enhancing our life (time). Transhumanists think that eventually eternal life, the singularity, can be reached. Others talk about enhancing human capabilities and expanding our consciousness. The driver differs; is it production efficiency, mental relieve or soul purpose? What clothes and tools will we surround us with and what systems will be coupled to define our (new) relationship between technology and the body? Following Stelarc’s discourse, Appendix Machina will be an artistic project, bearing a speculative and experimental mode through which ideas and artefacts are constructed, images and phantasms, possibilities and failures . There will be a lot of speculation, but guided by the research and artistic work, we make assumptions, sharing hopes and fears around the topic of human enhancement versus bodily obsolescence. Dani Ploeger is an artist and cultural critic who combines performance, video, computer programming and electronics hacking to investigate and subvert the spectacles of techno-consumer culture. Re-purposing, misusing, and at times destroying everyday devices, his work exposes the beauty, dirt and power of seemingly banal and taken-for-granted aspects of digital culture. 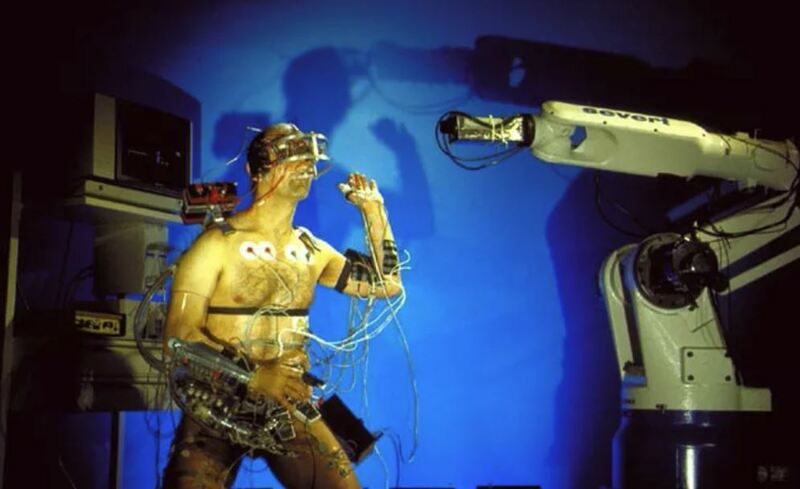 V2_ Archive – Stelarc Amplified Body (1994)– Stelarc’s Amplified Body was a performance with “industrial robot, medical devices and virtual reality support” that took place during the opening of the V2 building in the centre of Rotterdam in 1994.